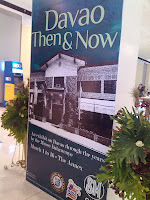 Davao Then and Now is an exhibit on Davao through the years by the Museo Dabawenyo. I had the chance to visit SM City Davao - Annex and see the photos taken decades ago. It amazed me how old buildings then progressed to a big well-known institutions now. This made me proud to be a Dabawenyo. Who would have known that those simple buildings are today's well-known landmarks in the city. I am inviting you to come visit Davao. Visit SM City Davao Annex to see legendary photos taken years ago and be amazed of its transition. Hurry, display will last until March 16. But if you want to see more, you can visit the Museo Dabawenyo.